Home Editorial Who Is The European Union Trying To Fool? AFRICANGLOBE – The European Union has removed from its illegal sanctions eight senior officials linked to the Zimbabwe Government. These are six heads of the uniformed and security forces, as well as the Minister of State for Presidential Affairs Didymus Mutasa, and war veterans’ leader Cde Jabulani Sibanda. 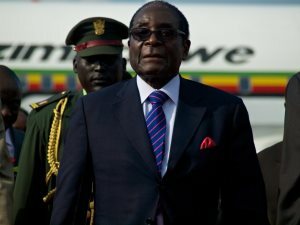 The bloc has retained on its travel ban list President Mugabe and the First Lady Amai Grace Mugabe. We are not going to be deceived by the EU’s insult to Zimbabwe through these British colonial tricks of divide and rule. To start with, there was never any legal basis for the sanctions, which were imposed unilaterally without the blessings of the full UN process. We call these silly old tricks because the bloc is clearly trying to drive a wedge between the President and the security structures. They hope heads of security agencies might be “softened” as a way of isolating the President so that these tried and tested veterans of the liberation war can then be used as future Trojan horses in finding chinks in Zanu PF’s revolutionary armour. The EU must understand that this piecemeal handling of their dirty sanctions is viewed in Zimbabwe as insulting, patronising and condescending. The Zimbabwe Government has tried to explain its bilateral dispute with Britain over the land reform programme. Zimbabwe embarked on the land redistribution programme in 2000 not only to correct historical land ownership imbalances inherent in the racist policies under successive settler regimes, but also to give meaning to the concept of majority rule. People went to war because they wanted their land back. Yet, according to Britain, respect for property rights meant that those settlers who had stolen land from Africans under the colonial system should have been allowed to keep it. At the instigation of its die-hard kith and kin here, Britain set up opposition political parties in a bid to stop the process. After realising that the fight was no stroll in the park, Britain then mobilised its racist tribesmen in America, Canada, Australia and the European Union to punish President Mugabe and his government in the belief that they could reverse the historic march towards black economic empowerment. These sanctions have nothing to do with democracy or human rights. The EU and USA got themselves entangled in a bilateral dispute in which they should have acted as neutral arbiters were it not for their racist, patronising attitude towards Zimbabwe. The USA went so far as to devise its iniquitous Zimbabwe Democracy and Economic Recovery Act in part to buy Tony Blair’s support in the planned invasion of Iraq. Over the years, EU member states have lost many opportunities to engage positively with Zimbabwe. In the course of the inclusive Government, Zimbabwe established a re-engagement team headed by Foreign Affairs Minister Simbarashe Mumbengegwi to help the EU see some light. It took a small country like Belgium to break from the herd when it realised that its diamond industry was under serious threat and that over 30 000 jobs were at risk so long as Marange diamonds were classified as “blood diamonds”. The simple message to the EU and the US is that the land reform programme is irreversible. Even the Whites whose minority interests they claimed to protecting have realised that they are fighting a lost cause and they would rather join forces with fellow Zimbabweans in calling for the total removal of economic sanctions under Article 96 of the Cotonou Partnership Agreement, not just travel restrictions. Their prosperity is better guaranteed here in Zimbabwe compared to any prospects they might have in Europe. The EU should leave Britain to resolve its bilateral dispute. If it decides that its Prime Minister David Cameron should boycott the EU-Africa summit in April because President Mugabe has been invited, so be it. Africa has taken a principled stand, one long delayed, that we shall not be dictated to by Europe on who should or should not take part in their deliberations. Like the EU of the past, Africa finally wants to speak with one voice, especially so against a former imperial power now almost reduced to a spectator in global affairs but still nursing a bruised ego against former colonies trying to assert their independence. European nations should not help Britain save face by engaging in childish tricks around sanctions. Get the economic sanctions off and start fruitful engagement that is mutually beneficial.